Consul General Dr. Sun Dali met with Mr. Andy Burnham, Mayor of Greater Manchester at Churchgate House, Manchester on Dec.11, 2017, in the company of Consul Lyu Xiaomei and Executive Director Rhys Whalley of Manchester China Forum. Dr. Sun congratulated Mayor Burnham on his new post and stated that communication and cooperation at sub-national level both substantiate and invigorate the bilateral relationship. He stressed the connection between ‘Belt and Road’ Initiative and the Northern Powerhouse Plan and expressed willingness to help Greater Manchester to expand cooperation with Chinese provinces and regions. 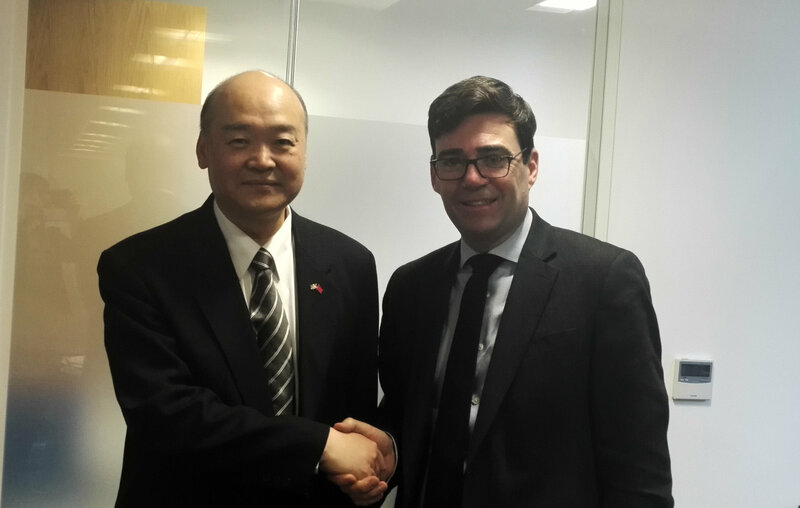 Mayor Burnham pledged continued work to build on Greater Manchester’s historical China link as well as commitment to expanding and intensifying partnerships with China on priority sectors like public transport and investment promotion.